Rate this Article The development and application of Haptic feedback for VR continues to make new strides with newly developed wearable devices. Let’s take a look at a brand new one. The VR industry continues to expand with a lot more devices and VR peripherals making their debut in the market. From VR masks to sandals, the list keeps going on. A lot of effort is going into making VR into a perfect experience. We truly are at the infancy of the technology as we still need to wear or attach contraptions and devices to ourselves for a chance to experience a complete feel of VR. One of the major aspects of the technology being worked on to optimize the experience is the body suit. Several versions are being developed from wearable vests to full suits that encompass the body of the user. Each one no doubt has it’s own advantages in bringing VR to a person’s body area. Body suits rely on Haptics or the sense of touch. Haptic feedback happens when you the gamer feels the sensation of physical contact as a result of playing the game. NullSpace VR, Inc. is a company founded by Morgan Sinko and his close colleagues Lucian Copeland and Jordan Brooks from the University of Rochester. They are continually working on ways on how to revolutionize the way gamers interact with Virtual Reality. After years of experimenting, prototyping, and testing, they where able to come up with a revolutionary Haptic feedback vest that delivers a fully immersive VR experience in terms of physical sensation. The vest which is worn like sort of a jacket lets the player experience a wide range of effects from being hit by something to feeling a blast of wind or a spray of water taking place in the game. 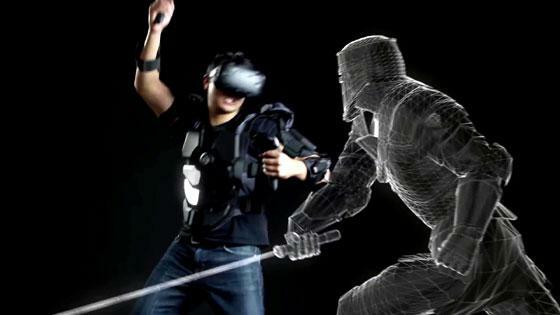 Actions like punching, hugging and rubbing in VR will be fully simulated through the vest. 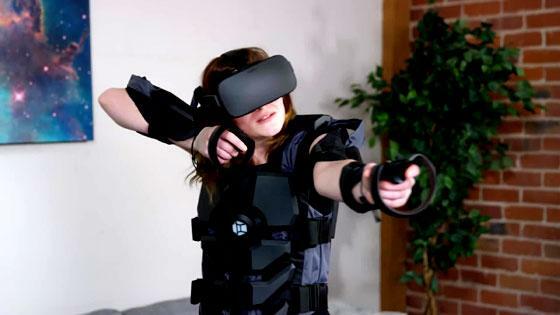 Called the Hardlight VR, the vest contain 16 programmable Haptic pads which are placed at strategic points that provide extremely precise touch feedback. It also uses a cadre of inertial tracking sensors to mirror the physical movements inside the game. This technique will let you see your entire avatar within the game and not just a head and a pair of floating hands. The Hardlight VR uses Vibro-Tactile feedback similar to that being used with console game pads where it vibrates and gives you a shockwave when you get hit by something in the game. At that, an audio haptic mode is provided as an option where you can experience the feedback when playing outside of VR. You can play console games with your X-box and PlayStation and experience the effect without having to wear a VR headset. The vest was developed to be adjustable and breathable so that people of different shapes and sizes can wear it comfortably. It was designed to sort of be adjusted once then simply worn like a jacket whenever it will be used. Specific sizes have been made available for both men and women. There are straps on the side that can be adjusted to fit both lean and bulky users. The arm straps can be adjusted as well depending on the size or thickness of your arms whether it’s flab, muscle or bone. Finally the shoulder straps can be widened or narrowed to fit your biceps and shoulders. This is the trickiest part to adjust and is usually set up only once. The vest only weighs around 3.5 pounds which is similar to a light jacket. Also, the weight is distributed around your body so you will barely notice it at all. The developers have pledged their commitment to provide Hardlight VR vests that will fit almost everyone as possible and invite people with unusual body measurements to contact them. GabeN would definitely want one for himself so, good luck to the developers. Also, the package comes with an easy to use Application Program Interface (API) to allow developers to add Hardlight compatibility to existing games. A huge library of immersive Haptic functions is provided as well. As of now, the vest is tethered to the PC via USB cable but the final version according to Sinko will be a remote wireless affair. The project was placed on Kickstart and has since then reached its kickstart mark. The company is targeting the release of the final commercial version around September of this year and is available as of now pre-ordered only through Kickstarter for a price of 499 USD. The day will come that all we need will be ourselves to experience VR in a Holo-Deck and VR may be able to experience us as well in the outside just like Robert Picardo running around the Starship Voyager with his mobile emitter. Till then, let’s use what we’ve got.